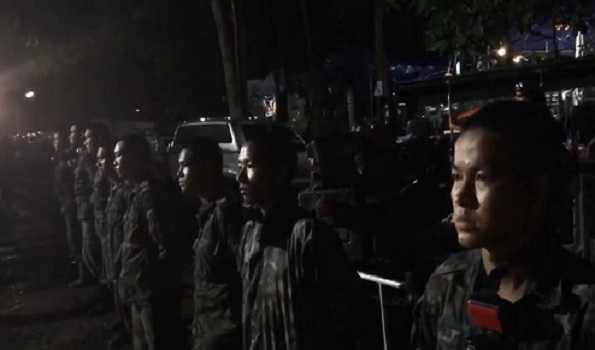 Bangkok: Cave divers in Thailand are poised to restart the high-risk operation to extract the remaining eight boys and their football coach from a vast flooded cave system, says a BBC News report. Four boys were brought safely out of the cave on Sunday.But the mission was paused overnight for air tanks to be replaced.Rescuers decided to go ahead with the hazardous operation because of fears of rising waters. The group have been trapped since 23 June. Activity at the dive site early on Monday suggests that the operation to free the remaining members of the group may be under way or about to resume.At least seven ambulances have driven towards the cave entrance.Rescuers took advantage of a break in the rain on Sunday to launch the mission earlier than some expected. The first stage of the mission ran "smoothly" and the rescued boys were in "good health", according to the Thai authorities.But with heavy rainfall overnight and more forecast for the coming days, divers will need to work quickly to free those still trapped. On Saturday, Narongsak Osottanakorn, governor of the Chiang Rai province, said that teams had a three to four-day window to carry out their operation. A team of 90 expert divers - 40 from Thailand and 50 from overseas - has been working in the cave system.They have been guiding the boys through darkness and submerged passageways towards the mouth of the Tham Luang cave system.Getting to and from where the boys are has been an exhausting round trip, even for the experienced divers. The process includes a mixture of walking, wading, climbing and diving along guide ropes already in place.Wearing full-face masks, which are easier for novice divers than traditional respirators, each boy is being accompanied by two divers, who also carry his air supply. The toughest part is about halfway out at a section named "T-Junction", which is so tight the divers have to take off their air tanks to get through. Beyond that a cavern - called Chamber 3 - has been turned into a forward base for the divers. In an indication of how dangerous the journey can be, a former Thai navy diver died in the caves on Friday. Saman Gunan was returning from a mission to provide the group with air tanks when he ran out of oxygen.He lost consciousness and could not be revived. His colleagues said they would "not let the sacrifice of our friend go to waste". This is a hugely high-profile rescue attempt and Thailand knows the world is watching. It has embarked on a dangerous option but believes it's the best for bringing the group out alive. It has assembled a team of internationally renowned divers and so far their expertise has brought four boys - thought to be the weakest - back to their families. But the relief of those mums and dads will be tempered by the knowledge that nine other families face an anxious wait for the turn of their loved ones to be shepherded through the narrow and murky corridors of the Tham Luang cave complex.